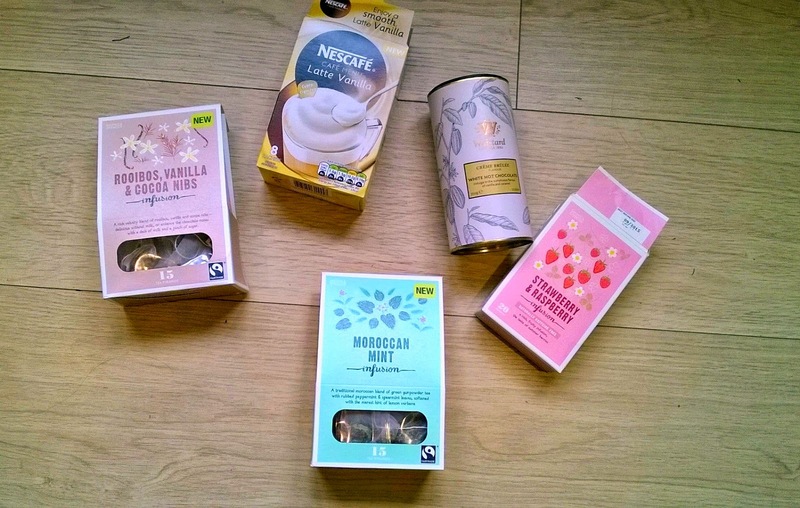 It's no secret that bloggers are a fan of tea (Please see any bloggers description on Twitter, Instagram or Bloglovin'), and I am no exception to the rule. I'm a true hot drink addict, particularly around uni deadline times, I can easily get through 4 or 5 cups a day when I'm trying to focus. My collection around the kettle in the kitchen is getting ridiculous now, in a house of 6 girls I own 3/4 of the hot drinks there. This all leads me to think that I'm starting to build up a little knowledge about tea, lattes and hot chocolate, and the best places to get it without paying a bomb. Marks is not an obvious choice for hot drinks, but their range of tea is truly impressive. Their most recent releases are their infusion pyramids in four different flavours. I absolutely adore Moroccan Mint, with 15 pyramids packed with mint leaves, lemon verbena and peppermint. You need to steep these types of teabags for a little longer, and only in freshly boiled water to allow for a fuller flavour. I love drinking this in the morning to wake me up with my breakfast (when I leave enough time to have more than scoffing a few biscuits whilst walking out the door). Also if I've been induced into a food coma after eating way too much for dinner, it's nice to drink this to get rid of that food baby. The Rooibos, Vanilla & Cocoa Nibs has a more peculiar taste, tasting almost like vanilla, and chocolate but more the taste of tea than hot chocolate. It feels more indulgent than a standard tea and the smell is gorgeous, I'm adjusting to the taste of Rooibos though. It's an acquired type of tea but I feel I'm coming round to it. Without a doubt though my favourite of the three has to be Strawberry & Raspberry infusion. You know sometimes drinking a fruit tea there's a tendency for it to smell a lot better than it tastes? This is not the case with this. It tastes amazing, so fruity and refreshing and all for a pound! The berry taste isn't synthetic either, really rich and natural. A more obvious option for hot drinks, particularly for their coffee, but personally I'm a huge fan of their latte and cappuccino range. Above you can see the Vanilla flavour, which is my absolute favourite but I've also tried Caramel, and Gingerbread! All are extremely similar to ones that you would buy in Costa, frothy and thick except with your bog standard mug and kettle from the comforts of your kitchen. These make a nice treat after a long day at uni when I've traipsed through the door. This brand has to be one of the best hot drink discoveries I've made this year! Their hot chocolate may be a little expensive, but their flavours are to die for! My lovely boyfriend a while ago bought me their Luxury White Hot Chocolate and I was hooked. The one pictured above is their White Creme Brulée Hot Chocolate, and it is honestly one of the dreamiest hot chocolate's I've ever had. You need to heat up hot milk to make this perfectly, and I've found heating up the milk in a separate mug then transferring it to another mug with the powder in best blends the mixture together best. The result is a gorgeously thick and frothy hot chocolate with a sweet and caramelly taste.